Having had tremendous success in our training programmes in Pordenone we are now looking to bring the Young Living Essential Oils to Milan in 2016. 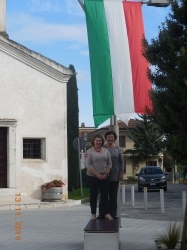 It has been two years since we first came to Italy and we have trained and assessed several students in Vitaflex & Raindrop Techniques, who have now been accredited and certified by us as Raindrop Technique Practitioners and they are now listed on our Raindrop Training Europe Practitioners Register. This Register is growing as more people chose to train and introduce these powerful oils to their own professional practices or use them for personal and family use. 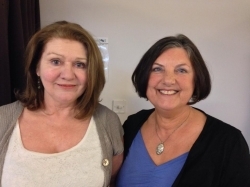 Raindrop Training Europe was formed by myself Sheila Crouch and Suzanne LeQuesne. We both have 30 years experience in the holistic medicine world; both having run successful private practices and being qualified lecturers, teaching in Health and Beauty Colleges in the UK for several years, as well as forming our own accredited training college. We are also both international speakers and authors on natural health subjects. It was about 4 years ago that we discovered the Young Living Essential Oils and found that we obtained exceptional results using them in our own practices and decided to go to the USA to train with Dr. David Stewart PhD. Himself having benefitted from the healing qualities of the oils, as a medical doctor, research scientist and church minister he decided to found CARE (Centre for Aromatherapy Research & Education) to both research and train people to work with the oils to the highest standards, to aid the health and wellbeing of all. Suzanne and I, having trained with him, have brought our knowledge of 60 years experience in the holistic field, together with his CARE training to Europe, to offer the highest possible education to those wishing to live life to the full and take control of their health and life. Examining how in ancient times essential and vegetable oils were used in healing, personal and domestic hygiene as well as in spiritual rituals including birth, burials and annointing of kings. A talk on how the frequency of Young Living Oils can be used for health, wellbeing and abundance. There is no reason to suffer pain or feel tired all the time. The body is designed to heal itself and if we give it what it needs. Too many of us are fooled into believing that illness is natural, it is not, although with today's unnatural options it is often normal. Discover how the life force of 100% pure Young Living Essential Oils and products can provide a healthy and effective alternative to over the counter drugs and a toxic free lifestyle. The qualities of these live oils carry frequencies that match different organs and systems of the body, including the mental, emotional and spiritual as well as the physical. This workshop can help us to manage emotions in our life and release the patterns that are limiting our happiness and success. Many of these can be laid down before we are born, so using oils that reasonate with our healthy, happy, natural state we can return to being our true vibrant self free of limitations that have been controlling us. Vitaflex is a Tibetan form of Reflexology which uses the piezo-electric abilities of the body to carry energy along nerve pathways and clear blockages. There are several techniques that are tailored to various systems of the body so that they are able to function better and rebalance the body. When used with 100% pure essential oils the benefits are even greater. The techniques can be used alongside any hands on therapy or on their own. Raindrop Technique is derived from the healing rituals of the Lakota Indians and involves annointing with Young Living essential oils along the spinal reflexes of the feet and on the spine. It has been found to be extremely relaxing and to relieve pain and aid postural problems. For those who want to experience this opportunities will be available to learn more and sessions will be available as well as a chance to train later in the year to use this on family and friends or professionally with a certified CPD. 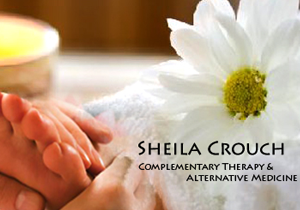 We offer two levels of Aromatherapy courses. This includes 6 practical days of training which integrates the online theory course with appropriate application of the oils safely in massage to diffusing plus much more. A written paper based on the online theory course is also included as well as an assessment of practical skills. When all the requirements are achieved a Certificate will be given, which is accredited by the Association of Beauty Therapists (ABT) in the UK, as are all our professional courses under College 81 in their list of approved training providers.